As an undergraduate piano major at Oberlin College Conservatory of Music, John became fascinated with the inner workings of the piano, ultimately spending more time in the conservatory piano repair shop than in the practice room. 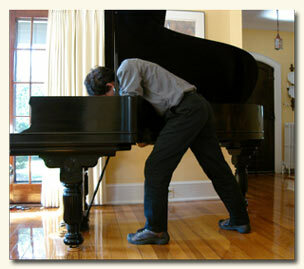 He studied piano technology there as a student assistant under the guidance of then-head technician, Ken Sloane. After receiving a B.A. in Music from Oberlin College, he attended the two-year course in piano technology taught by William Garlick and David Betts, teachers at the North Bennet Street School in Boston, MA. John has worked in North Carolina as an independent piano technician and piano rebuilder for the past 30 years, servicing and rebuilding pianos for private individuals, colleges, and concert venues. He is presently on the staff of the Dept. of Music at the University of North Carolina at Chapel Hill as the full-time piano technician, and also maintains the concert Steinways for the Carolina Performing Arts Series held at Memorial Hall. He continues to play classical piano as an avocation, along with enjoying Old-Time music from the foothills of North Carolina. Occasionally he's been known to play banjo and dance.